“Whatever Your Major, Computing Sciences Is for Everyone,” the current exhibit in Falvey’s cultural window space, coincides with Computer Science Education Week, which is celebrated Dec. 9 – 15 this year. Department of Computing Sciences faculty collaborated with Joanne Quinn, Falvey’s design specialist, to create the exhibit. “Computing Sciences Is for Everyone” includes digital slide shows, a selection of books with interesting titles (including some written by computer science faculty members), magazines “whose covers and lead stories suggest the breadth of the computing discipline,” a model human brain, a Lego® robot, an original work of art, various informational posters, a white banner filled with binary code and a collection of computer-related comic strips. Quinn created the title banner and compiled the comic strips. Lillian (Boots) Cassel, PhD, Mary Papalaskari, PhD, and other computer science faculty created the rest of the exhibit. The model “brain represents our interest in artificial intelligence … which is an important component of robotics, but also of machine learning (see the display’s poster about ML and babies) and other applications that require something that resembles intelligence,” says Dr. Cassel. A blue and white work of art, in the lower left portion of the display, features a large white banner of binary code (0s and 1s), small humans, a chemistry flask, and other objects. These appear to emanate from a fragment of a human face with large eyes, suggesting that the objects are the person’s thoughts. This artwork and the sweeping white banner filled with binary code, which unites the exhibit, are the work of Dr. Papalaskari. 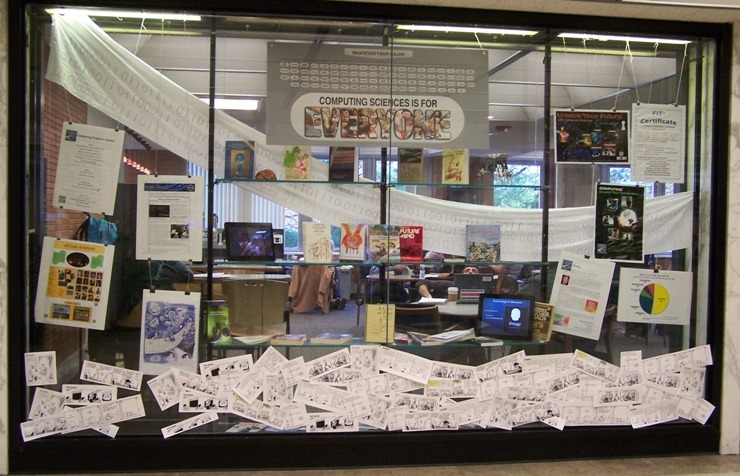 The collection of computer-science-related comic strips across the bottom of the window provides an amusing end to an otherwise educational exhibit. 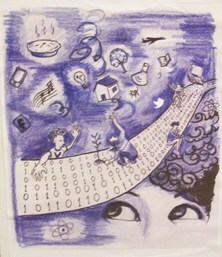 “Computing Sciences Is for Everyone” will be on display until January.